Sorry again for the lack of posts recently, I've just been busy with uni work and I also just got back from a Disneyland Paris trip (expect a post!). 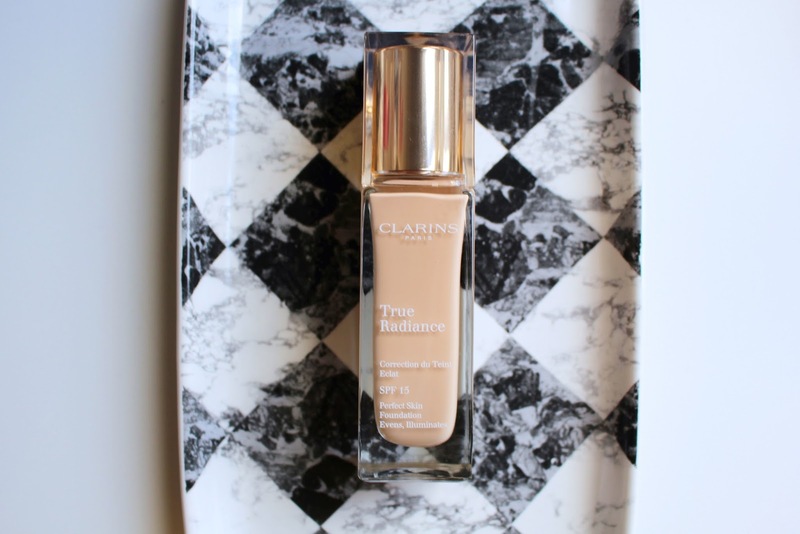 Today I want to talk about the Clarins True Radiance foundation. 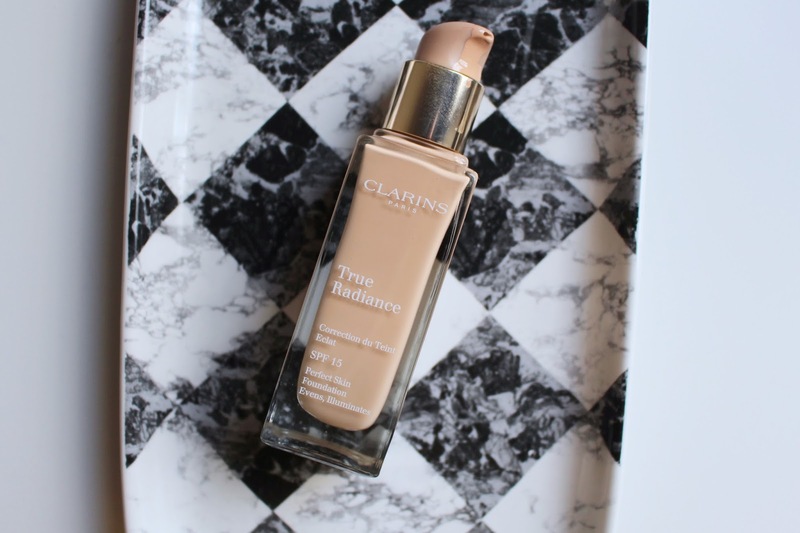 I picked this up from Boots a while ago as I was really wanting a high end foundation without going for the cliche blogger picks! My mum uses Clarins make up and I was really impressed with her lipstick so thought I would check out their whole range. I read the reviews on this foundation and every single one was 5* or 4* with comments like, this foundation covers blemishes and pimples flawlessly and if you have dry skin this foundation won't show it up it's amazing. Being someone who suffers from acne and dry skin these comments made me click 'add to my basket' extremely quickly. I got the colour 103 Ivory as my skin is pretty pale and this seemed to be the lightest shade that looked close to my natural skin colour. The packaging is really simple but really elegant at the same time, and the bottle feels really nice (is that a weird thing to say? I don't know haha). The first thing I noticed about this foundation was the smell, it smells exactly like watermelon!!! The consistency is kind of the same as L'oreal True Match which instantly made me love it as I love True Match. It is a thin consistency and gives off a medium coverage (apparently). Personally I would say the coverage is pretty light but it is build-able if you wait for the first layer to set a bit before adding another. 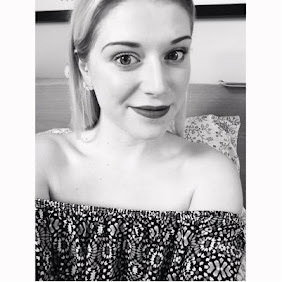 The colour wasn't a perfect match because the foundation is really quite orange, in the bottle it looks pale and true to colour but once it was one my face I felt like it was super noticeable I was wearing foundation, this really annoyed me because I'd spent like £27 on it! But in saying that it does have a really lovely silky feel on your face, and I thought it was extremely easy to apply and didn't leave traces of brush strokes or anything. As for the wear of the foundation, it lasted all day and I mean ALL day! I was really surprised that at the end of the day when I came to take it off I still had the same glow I did when I put it on! For me personally I don't think that it covered my acne very well (but then that's what concealer is there for haha), but in regards to the dry skin comment someone left, they were so right! I have dry skin all around my nose and sometimes on my cheeks and this foundation didn't even detect them. This made me feel a lot more confident! Overall I love this foundation but for me it just isn't full coverage enough! Although I would highly recommend this to people with dry skin! I am still on the look out for a really good high end foundation that is good for combination skin and covering acne! 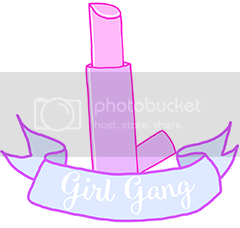 I would love to hear your suggestions in the comments!! 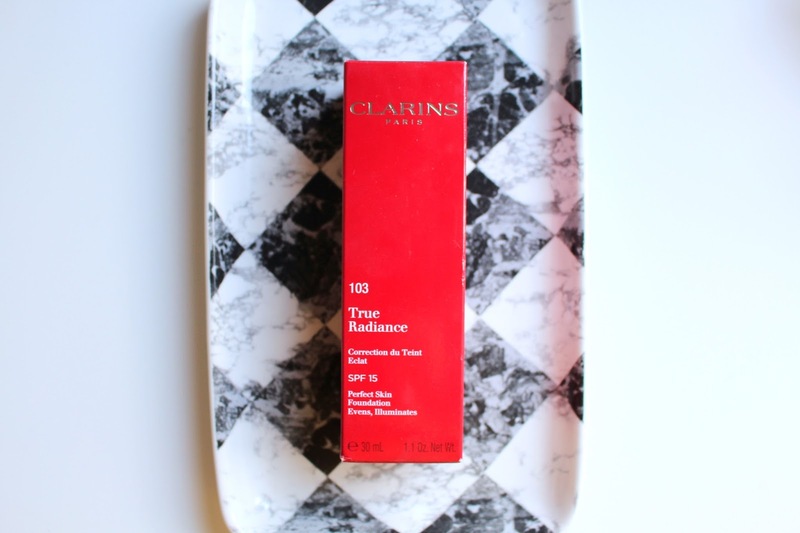 Have you tried any Clarins make up? What did you think?! I'm going to have to try this out on the days which I want less coverage!